Nutri Fill-It is a re-useable food pouch designed to carry homemade smoothies, yoghurts and just about all pureed food. Rather than buy shop brought snacks (which are often laden with sugar and additives) make you own and use our re-usable pouches to store (n the fridge or freezer) and transport them quickly and easily. How is it different from other re-usable pouches? Most of the re-usable pouches on the market hold approx 100mls of liquid. Great for babies but not so hot for older children and grown ups! Nutri Fill-It holds 300mls. The perfect amount for a lunch time treat, a post work-out boost or an after school snack. 2. 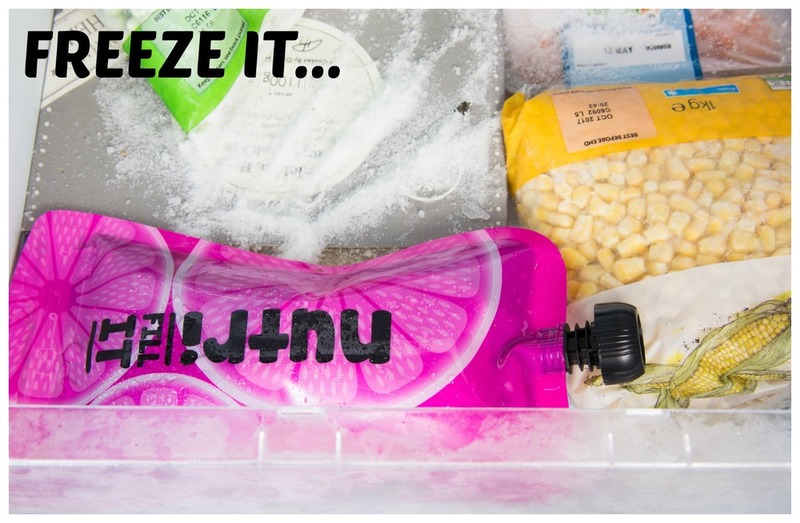 Fill It - pour your smoothies directly into your Nutri Fill-It pouches, seal the bottom with the 'anti-leak' Double Zip Lock and store in the fridge or freezer. Nutri Fill-It Reusable Pouches are BPA Free, Pthalate Free, PVC Free and Lead Free.